The questions most often heard in Christian circles are: “What is an apostle,” and “How do we recognize him?” The answer to these questions is precisely the reason why this book was written. In it, you will find clear and precise guidelines that will help you understand the apostolic ministry: the characteristics, functions, purpose, and signs that distinguish true apostles form the rest. Each of the five-fold ministries – pastor, evangelist, teacher, prophet, and apostle – has a distinct seal that is unequal to the other. 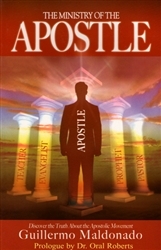 God gave the apostle a seal that many try to imitate, unsuccessfully. 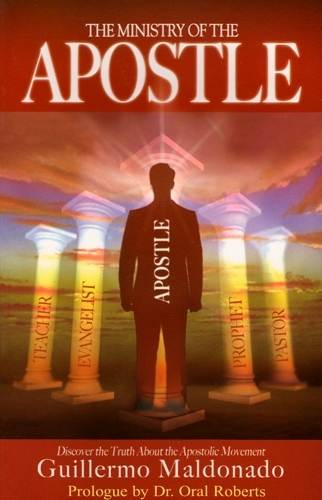 Throughout the pages of this book, you will be taught to recognize the characteristics of a true apostle of God, and you will learn about the apostolic mentality – what his heart is like, what his mission is, what tools he uses to build the church and much more. Guillermo Maldonado is an apostle called to establish the Kingdom of God at the local and international level. He is the founder of “El Rey Jesus International Ministry”; a Hispanic church in the United States that is recognized for its fast growth and powerful manifestations of the Holy Spirit. He obtained his Doctorate in Divinity at the Wagner Leadership Institute (WLI) and a Doctorate in Philosophy in Christian Counseling from Vision University in Lake Worth, Florida. Pastor Maldonado, with over 20 years of experience in the ministry, stands firm and focused on the vision God gave him which is to: evangelize, affirm, disciple, and send; His purpose is to encourage leaders to become true spiritual fathers who are capable of leaving a spiritual legacy of blessings to future generations. The mission that the Lord gave the pastor and apostle Guillermo Maldonado embraces the United States, the Caribbean, Central America, South America, and Europe. He is the spiritual father to many leaders and apostles of local and international churches. At this time, Pastor Guillermo Maldonado resides in Miami, Florida, with his wife and partner in ministry, Ana, and their two sons Bryan and Ronald.